(CNN) – Republican Sen. Marco Rubio, who consistently makes the short list of potential GOP vice-presidential candidates, on Sunday offered a ringing endorsement of Jeb Bush for the No.2 spot. Bush, the former Florida governor, recently said he hoped Rubio would accept a potential offer from presumptive Republican presidential nominee Mitt Romney to serve on the ticket, and Rubio returned the compliment. "Well that's very nice of Jeb. I hope he'll say yes if future President Romney asks him," the senator from Florida said of his political mentor in an interview set to air on CNN's "State of the Union." "I think he'd be a fantastic vice president." 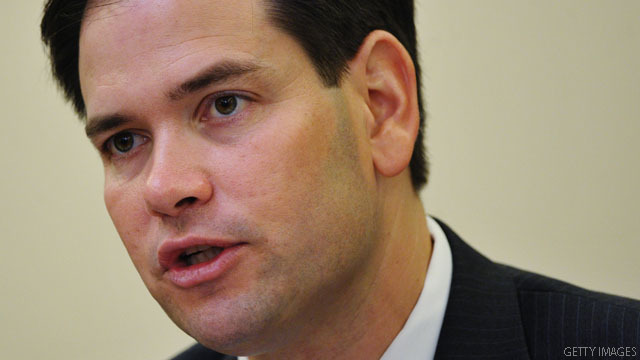 Despite continual questions regarding his political future, Rubio vowed to stay out of the "veepstakes" chatter going forward, given that the official process is now in place. Romney appointed Beth Myers last week to head his search for the individual who will complete the GOP ticket heading into the November general election. "The last thing he needs are those of us in the peanut gallery to be saying what we would or would not do," Rubio told CNN Chief Political Correspondent Candy Crowley. "I know that Mitt Romney's going to make a great choice for vice president." The first term senator and tea party favorite on Thursday said he would reject a vice-presidential proposal, adding his focus is on his Senate tenure. He and Romney are scheduled to campaign together on Monday.